What Day Of The Week Is August 24? 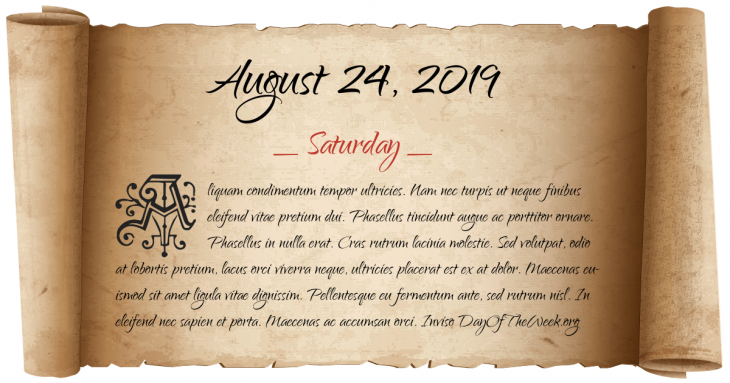 August 24, 2019 is the 236th day of the year 2019 in the Gregorian calendar. There are 129 days remaining until the end of the year. The day of the week is Saturday. Mount Vesuvius erupts. The cities of Pompeii, Herculaneum, and Stabiae are buried in volcanic ash (note: this traditional date has been challenged, and many scholars believe that the event occurred on October 24). King John of England, signee of the first Magna Carta, marries Isabella of Angouleme in Bordeaux Cathedral. The first official English representative to India lands in Surat. The modern Constitution of the Netherlands is signed. The Treaty of Córdoba is signed in Córdoba, now in Veracruz, Mexico, concluding the Mexican War of Independence from Spain. Second day of two-day Hebron massacre during the 1929 Palestine riots: Arab attacks on the Jewish community in Hebron in the British Mandate of Palestine, result in the death of 65-68 Jews and the remaining Jews being forced to leave the city. In the Spanish Civil War, the Basque Army surrenders to the Italian Corpo Truppe Volontarie following the Santoña Agreement. The treaty creating NATO goes into effect. Who were born on August 24?